Courthouse computer security, enterprise zones and road work were among topics discussed at Monday’s meeting of the Monroe County Board, but the matter drawing the most attention this week is a proposed wind farm in the bluffs. Local developer Joe Koppeis, who was not present at the meeting, sought endorsement from commissioners on a letter regarding his plans for a 50-tower wind farm that would stretch from Valmeyer to Fults. The letter presented to the board Monday is one Koppeis hopes to send to affected rural landowners. The letter states that the proposed wind farm would generate both tax revenues and energy. The placement of the towers, estimated at more than 300 feet tall, is to connect to the Baldwin Power Plant, Prairie State Energy Campus, Meramec Power Plant and Rush Island Power Station. 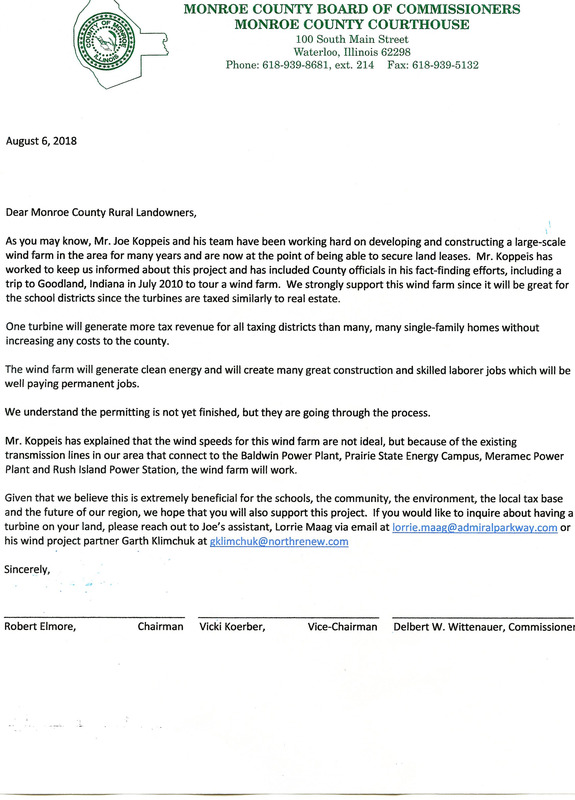 “Given that we believe this is extremely beneficial for the schools, the community, the environment, the local tax base and the future of our region, we hope that you will also support this project,” the letter from Koppeis to landowners states. To view the entire letter, click here. The commissioners, in tabling the request, noted that this is a long, ongoing process and there may be environmental issues to resolve, as well as the process of securing access to land. The commissioners invited Koppeis to attend a future meeting to answer questions. Koppeis, who has developed such local projects as Rock City in Valmeyer and 11 South in Columbia, plans to discuss his $220 million wind farm proposal at the Aug. 20 county board meeting. The newly formed Facebook group “Save The Bluffs – Say NO to Joe” is adamantly opposed to the wind farm. In 2012, the county board worked to pass a wind farm ordinance after Koppeis identified himself as a potential wind farm developer earlier that year. Koppeis said at that time he started looking at a turbine to go above the underground freezers at his Rock City business development in the Valmeyer bluffs. Read more on the county board meeting in this week’s newspaper. For more on the wind farm issue, pick up the Aug. 15 paper. To subscribe, click here.